The first round of stroke play at the US Amateur has a familiar name to Carolina golf fans at the top of the leader board. University of Georgia rising junior Trevor Phillips from Boiling Springs has a share of the lead after the first 18 holes. Phillips, playing at Pebble Beach for his first round carded 2 bogeys and 6 birdies for a 4-under par 68. He is tied with Daniel Hillier, who played the Spyglass Hill course. Spyglass has a different par rating than Pebble Beach. Hillier also shot 4-under par, but he earned his share of the lead with a 67 on a par 71 course. 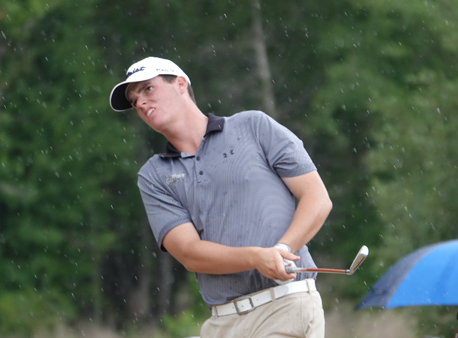 Future Clemson golfer Zack Gordon from Gaffney shot a 1-under par round to open play at the US Amateur. Future Clemson golfer Zack Gordon from Gaffney shot an opening round score of 1-under par at Spyglass Hill and is tied for 12th place. Phillips younger brother Trent shot an even par round of 72 at Pebble Beach to be tied for 28th. Trevor Phillips will have an 8:54am tee time on Tuesday at Spyglass. Gordon will tee off at Pebble Beach at 1:08pm and Trent Phillips will play Spyglass starting at 1:16pm. Phillips won the Spartanburg County Amateur in July. 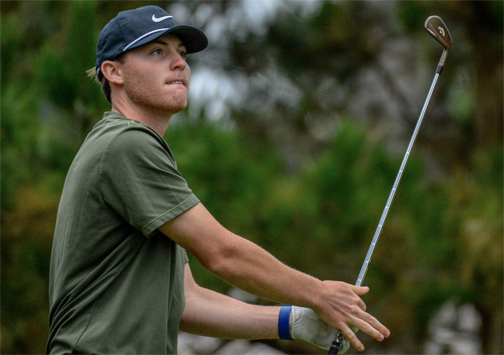 He has played the Pebble Beach course each of the last two years with his Bulldog teammates in the Carmel Cup college tournament. Here is Trevor Phillips post round interview from ASAP Sports. Q. Welcome back to the U.S. Amateur. Four years since you’ve been here, and you come back with a bang. TREVOR PHILLIPS: Yes, sir. I just tried to take the momentum I had from the qualifier straight to here and just tried to be as calm and possible and realize that there’s a lot of holes and there’s a lot of matches to win. So just take it easy and just try to take it all in and have a good time. Q. You flipped a switch on the back nine. It starts with 11, the par-5. TREVOR PHILLIPS: I can thank my putter. I just was reading the putts so good today. Speed was key, and I never blew a putt by. So the speed was on, so I just kept picking the right lines, and the putter got hot. Q. That’s a pretty good approach into 18. TREVOR PHILLIPS: Yeah, I appreciate it. I was thinking about hitting driver, but I just wanted to sting a 3-iron because early on in the round I made two 30-footers for par because I was in the rough and I had nothing, and I had a really tough up-and-down. That kind of kept me going. And then I just figured that out, and I just started keeping it in the fairway on the back nine. Q. What did you have on your approach and what did you hit in? TREVOR PHILLIPS: 170, and I hit a little high draw 9. Q. The birdies on 14 and 16, tell me about those. TREVOR PHILLIPS: Oh, man. The one on 16 might have been one of my best birdies ever. I hit a 3-iron and I had to hit it under the tree, and me and my dad talked about it, we wanted to run it up, but at the last minute I was like I can, hit it shot, and I hit like a low riser cut 4-iron, and it landed on the front and rolled up to about 20 feet, and I made it. It was one of the sickest birdies I’ve ever made. Q. Where would you rate this round? Sounds like you had some unbelievable shots in this round. Where would you rate it amongst all the rounds you’ve played? TREVOR PHILLIPS: I would say it’s one of my best rounds. Just because from the start, on the first hole, I hit a — probably a 90-yard shot from a bunker, and I don’t really miss many greens with wedges but I missed it there, hit the bunker shot out and made a 35-footer for par, and that kept me going. I don’t know if I would have shot what I did today if I didn’t have that momentum. I just tried to keep going and keep going, and on that back nine, the putter got hot. Q. Why do you think it’s been so long since you’ve been in the U.S. Amateur? What kept you out of it? TREVOR PHILLIPS: Well, I tore my ACL when I was snowboarding. I used to snowboard a lot up in Boone Mountain, North Carolina, and just was going through the woods one night following my buddy, and it was a little jump and I didn’t see it, and I flew into a tree, and my knee twisted, and I felt like I broke my leg, but I didn’t. I just tore my ACL and meniscus and my MCL. It just took me a while mentally. It probably took my first year of college and a little bit of this year, about two tournaments, the Carmel Cup and one more, and then I started playing well in Oregon at the Nike Invitational. Q. Did playing in the Carmel Cup help you here this week? TREVOR PHILLIPS: Oh, sure, because obviously I played cypress before Pebble, and when I came to Pebble, I was still like — I was paying attention more to the scenery than I was to the golf, and now I feel like I can really focus on golf because I’ve seen it all. That’s kind of what helped me this week. Q. And then obviously you put yourself in a great position to get to match play. Are you one of those guys that’ll just keep firing tomorrow or will you play a little bit more conservatively? TREVOR PHILLIPS: I’m just going to keep with my game plan and just keep trying to hit good shots and keep trying to take my time on the putting and just try to roll them in tomorrow again.